She runs a foundation dedicated to forgiveness. He’s a cop running down the guilty to make them pay. If they don’t work together, people they both love will die. Detective Bel Belichek and his partner arrive at a murder scene in a peaceful, historic section of Fairlington, Va., only to realize the victim is the cousin of Assistant Commonwealth’s Attorney Maggie Frye. The family tragedy that forever scarred Maggie and her cousins, Jamie, and Ally, reaches into the present, threatening to claim more lives if Belichek can’t find this murderer. And to do that he has to shut down emotions he’d thought were gone for good. 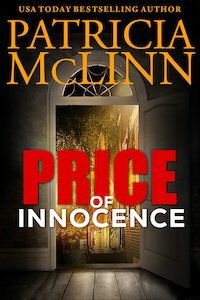 Price of Innocence, coming in 2019, is a sequel to Proof of Innocence that can also be read as a standalone. If you love twists and turns, characters who stick with you, and mysteries and romance swirled together, you'll love Price of Innocence. In the meantime, read an advance excerpt of book 1 in the Innocence series, Proof of Innocence, ready to pre-order now. Note to my CAUGHT DEAD IN WYOMING readers: Proof of Innocence and its upcoming sequel, Price of Innocence, do not have nearly as much humor as the Caught Dead mysteries, though there is some. (I just can't help myself.) They're a bit grittier and darker ... though not in the deep end of grit and dark. I strongly recommend you read the preview to be sure this is something you would enjoy.